In Memory Of Sweet Pugsley Who Is Now At "Rainbow Bridge"
This is our late English Cocker Spaniel, "Pugsley" aka "Puggers", whom we were blessed to have as a part of our family for 5 years. He LOVED empty water bottles(!) and would wait for you to finish so he could have it. Many, many bottles of water were chugged in this house to please him! He loved walks, playing with stuffed toys, and of course, treats! He suffered from seizures from the age of 12 months upwards. 3 weeks ago, he contracted something called IMHA. I noticed he acted like he didn't feel well on Saturday, and he was about the same on Sunday. By the time I took him to the vet on Monday morning, he was seriously ill. He passed away that night. I'd never heard of this and urge all pet owners especially Cocker Spaniel owners to read up on this disease and become familiar with the symptoms. It can be swift and a lot of the time, as with our Pugsley, fatal. Although our hearts are broken, our lives are richer and we are blessed to have had him for 5 years. Comments for In Memory Of Sweet Pugsley Who Is Now At "Rainbow Bridge"
Sammee just past away 2/1/15 from IMHA. I had never heard of this diseases. Three days and she's gone. I still can not believe it. Sammee Lynn was 6yr 7mths old. Still acting like a puppy. The speed of this diseases is unbelievable! I'm so sorry for your loss of your beautiful Pugsey, he looks adorable. I too lost my beautiful cocker, Molly, to this dreadful disease and like you, I'd never heard of it. It broke my heart when I lost Molly, so I know exactly what you are going through - it's so unfair when they go so young. RIP dear Pugsey you will never be forgotten, run free at rainbow bridge with all your doggy friends. RIP Pugsey and my beatiful Molly. For Pugsley's family and all who have commented on your loss, I am deeply sorry. My Molly will be 12 in March of 2012 and I can't even bare the thought. It will destroy me for sure. I had to put a dog down approximately 15 years ago and it really hurt, so I cam sympthasize. I was so sorry to hear of your loss even more so, the illness he died from. I have experienced firsthand the devastation of this illness. 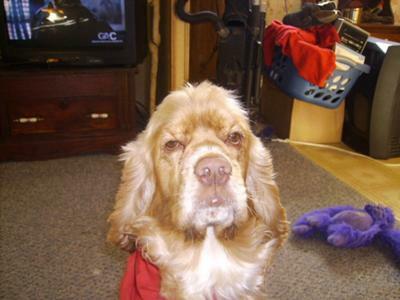 I lost my older cocker spaniel, Hannah Rose on October 7, 2010. It was her 12th birthday. She was diagnosed with Autoimmune Anemia in December 2009. Luckily, she was already at the vet being treated for a back problem, so they were able to start a blood transfusion immediately. Through the dedication of a wonderful vet I had Hannah 10 more months after she was diagnosed. She was on medication daily to keep her red blood count in the normal range. Even though she was never able to get off the medicine, she had a good 10 months with me. The day before her birthday she went into kidney failure. Again my vet, knowing that this was probably the end for Hannah, continued to do what she could to save her. The next day there was no change in her condition so I was on my way to the vet to be with her when she was put to sleep. Hannah died about 10 minutes before I arrived at the vet. My vet let me spend time with Hannah and then took her back to prepare her for burial. She brought her back to me wrapped in pink material bound by three pink ribbons. She was my first dog as an adult. So it is still very difficult. I still have my 7 year old cocker Gabe, but Hannah was my baby girl. He was my baby, I would of done anything to make him better but it was too late. He will forever be the only puppy that stole my heart and kept it forever! I'm so sorry for your loss, I also know about Rainbow Bridge as our beloved FiFi was put to rest just one month tomorrow. She was a toy poodle apricot and I had her for 15 1/2 years. She was, and still is, the love of my life. We had her cremated and she is back home with us next to my bed. We have the story of Rainbow Bridge on the wall next to her, it was with her when we brought her home. I never thought it would hurt so much to loose an animal I find myself lost and crying most of the day. We are in the process of adopting a brown and white 7 year old cocker from the cocker rescue agency. She is so sweet and we look forward to bringing her home. Thank you for letting me share my story and I'm sure Pugsley and FiFi are playing together at Rainbow Bridge. Awwwww Pam, I am so sorry for your loss. I don't know what I would do if I lost my Bella and she has only been a part of this family for 10 months. Pugsley looks like good ole Buddy! Much love. I surely miss Pugsley, whom I called Fletch! I still wait for him to bring his pony to the door when I get home! Now he's keeping Buddy company in Heaven - and surely raising cain! I miss you Fletch! Poor Pugsley - I cried when I read this as it brought back memories of when my beloved cocker spaniel left me. His name was Benji and I loved him so much. I don't suppose you'll ever forget Pugsely but I hope the heartache leaves you soon.